Getting engaged is certainly one of the most exciting experiences that any couple can go through. While there are a lot of couples who will opt for shopping together for rings, there are still some brides to be who prefer the surprise element of her guy popping the question. No matter what type of situation you are in, there are several things that you need to keep in mind as you shop around for engagement rings. After all, this is not only a gesture of love and commitment but it is also an investment in your future together as a couple. Any couples who have made the step of talking about getting married might want to think about going window shopping to see what types of rings interest them. By starting early, the groom to be can get some insight as to the type of ring that she is hoping to get. By the same token, it will also give a good, solid price range so that you know what you are going to be looking at for price and a future investment. One of the major things that couples will take into consideration is whether or not they want the engagement ring to coordinate with the rest of the wedding jewellery. If you are a stickler about having everything match, you may want to look into a collection where you will be able to get an engagement ring along with both wedding bands. Sometimes you will even be able to purchase a wrap that will go around the engagement ring that matches up with whatever band you decide to have the groom wear. As you shop for engagement rings, you are going to find that there are literally dozens, if not hundreds of options that you can choose from. You will have the ability to pick through the cut of the diamond along with the type of precious metal that you want the band to be made out of. If you have a difficult time picking out just the right engagement ring, you may want to talk with a jeweler about customizing a ring to suit both your tastes as well as your budget. This way, the both of you will know that the engagement ring is an investment that matches up with the perfect idea that you have in mind. 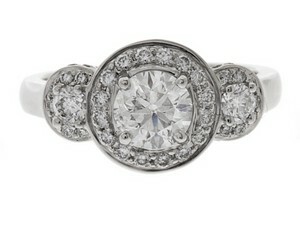 In the end, you are going to see that putting time and effort into search for engagement rings will be well worth it. If You Like It, Put a Ring on It! Stacking Rings: In or Out?